Steven (Chicagoland, United States) on 10 December 2014 in Plant & Nature and Portfolio. Designed as an idealized tropical landscape, it's where graceful palms, interspersed with a variety of other tropicals, soar up to a vaulted ceiling. This room features a massive Scheelea Palm which is probably the largest of its kind in any conservatory in the country. In 2003 the Palm House underwent a restoration of its structure and plant collection. Designed by Jens Jensen and first built in 1907 with glass panels, the Palm House was rebuilt in 1958 with fiberglass replacements. In 2003, the room was renovated once again, but this time, with glass to more closely resemble Jensen’s original design. The Palm House is shaped, not like a typical A-frame structure, but like a dome. Jens Jensen wanted to pay respect to the Midwestern location of this conservatory by designing the Palm House ceiling to resemble a giant haystack. 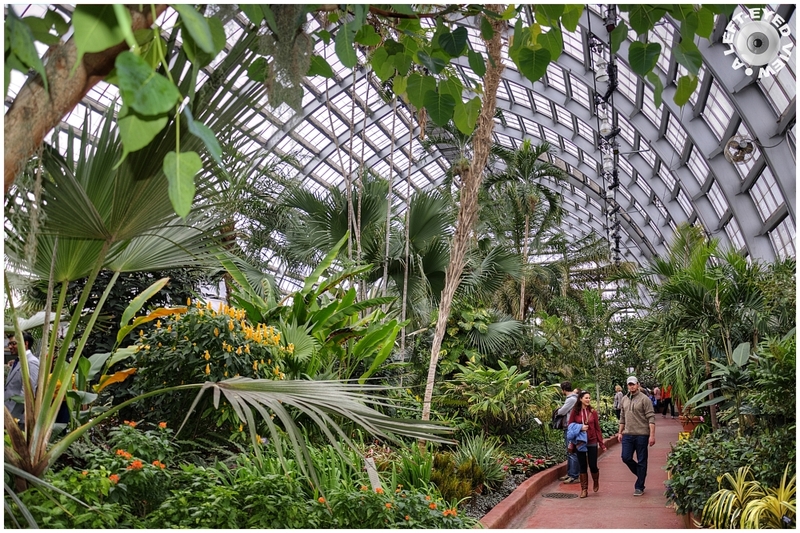 In 1926, botanists from the Field Museum of Natural History gave Garfield Park Conservatory a gift that kept on giving: the seed that grew the Scheelea Palm. Scientists acquired the seed on an expedition to Brazil, brought it back to Chicago and it has been growing at the Palm House ever since. The Scheelea Palm now has the distinct honor of being the largest (but not the tallest) plant in the Palm House collection. This type of cultural exchange is a powerful example of the connections shared between Chicago’s historic institutions over the years. Photo captured March 22, 2014. A beautiful interior shot of this conservatory. I'm glad the windows had glass put back in them. A return to Eden with this unique biosphere. Superb shot with the people giving a sense of scale. A beautiful capture of this magnificent palm house. Looks to be a wonderful place to visit ! A fine image of this marvelous conservatory. I can almost feel the humidity of the place from looking at your excellent shot. Incredible place full of lush green foliage ... beautiful photo! You have captured a lovely path through the garden. The clarity and detail are splendid! That is an excellent shot. I can almost feel my allergies kicking in. What a wonderful place. Amazing that it was built over 100 years ago. I love the lush foliage! It would be a great place to escape for an afternoon! what an impressive story to go with this beautiful look at the interior of the "jungle" !!! Splendid composition with all those vanishing lines guiding the eyes to the people on that path. Great ! !